January 1st, 2009. The phone is ringing... 6 am. I knew there could only one reason the phone would be ringing at such an hour on New Year's Day. Our flights to Curacao were delayed due to the weather, putting the pinch on our connection in Aruba. At least they weren't cancelled. Feeling a bit dusty from the night before, we rolled over and went back to sleep for a few hours. It took us awhile to decide on a destination... we wanted to go somewhere neither of us had ever been, and also somewhere a little off the beaten path. 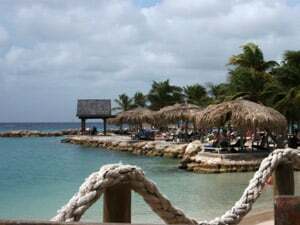 With a little research, we found Curacao, part of the Netherlands Antilles and slightly less touristy than its neighbor Aruba, though slightly more expensive to get to. Due to our busy schedules, the only time we could go was the first week of January. 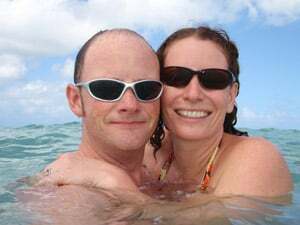 We booked through Breezes, which made our trip quite affordable, and were able to route through Aruba rather than Miami (so we could enjoy our layover in tropical weather); airfare and an all inclusive hotel for one week only cost just over $3,000 for the both of us. After being delayed in Boston, we arrived in Aruba as our connecting flight to Curacao departed the airport. 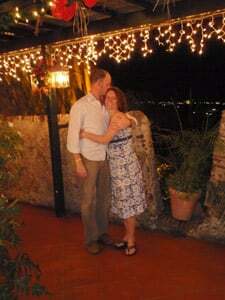 We picked up our bags, shrugged our shoulders, and went out to dinner in Aruba. We enjoyed drinks and appetizers at a busy tappas restaurant, and even had time for a stop in Hard Rock Café. Four hours later, we boarded a tiny plane for the short flight to our final destination: the Breezes Hotel in Curacao. So after a long day of travel, we checked out our room, and then pulled up a seat by the pool for live entertainment, free drinks, and late night dinner. During our week, we spent about half of our days lounging on the beach with frozen daiquiris and snorkeling the beautifully clear waters, which was amazing; we spent the other half of our time driving around in our rental car (about $70/day, available at our hotel) exploring the island with its beautiful beaches and popular local restaurants. One of our favorite experiences was visiting Jaanchie's, one of the more popular places to dine on the island. There is no written menu, and sure enough, Jaanchie himself pulled up a chair at our table and told us what was available for lunch. I enjoyed some incredibly fresh fish while Steve tested the iguana stew. The food was great and the environment was fun, and Jaanchie gave me a painted wooden parrot! So despite the long wait and somewhat high price for lunch (about $25 pp), we had a great time and would recommend it to everyone. Another great experience was one night at the Japanese restaurant at Breezes. We sat at the grill and watched our food prepared, which was fun, and the chef was great. The night was filled with great conversation (we sat with three other couples), delicious food, and good drinks. We had to book two days ahead to get a reservation, but it was worth it (and free!)! Other great experiences included driving through the National Park, snorkeling at Kalki Beach (which is not far from Jaanchie's), dinner at Fort Nassau, and wandering around the shops in Willemstad. We spent some evenings in Willemstad as well, but the nightly entertainment at Breezes was great, so most of the time, we stuck around and enjoyed drinks at the pool bar and listened to live music. Some of the downfalls of staying at our hotel: while the food at the buffet style restaurant is generally great (and free), there is often a struggle finding a table with silverware, a scrum around the food, and very busy waitstaff. Also, while all non-motor water sport rentals were free, there were lots of restrictions about when and where you could use the boats and kayaks. And the staff, while generally friendly, was not very good at solving problems. So, on January 6th, when we were given the opportunity to sail with a friend to Aruba, we jumped at the chance and checked out a day early, ready for a new adventure. We arrived in Aruba early on the morning of the 7th, had a great breakfast at the Dutch Pancake House in Oranjestad, and then spent the day at Eagle Beach, voted one of the top ten beaches in the world. After spending half the day sunning ourselves and swimming in the ocean, and after a week of seemingly endless sun and relaxation, we brushed the sand off, headed to the airport, and boarded the plane. We arrived in Boston several hours later, coated in sand, sun burnt, and smiling.